How do descendants of slaves find their ancestors? Georgetown’s decision highlights the difficulties black Americans face in tracing their lineages. 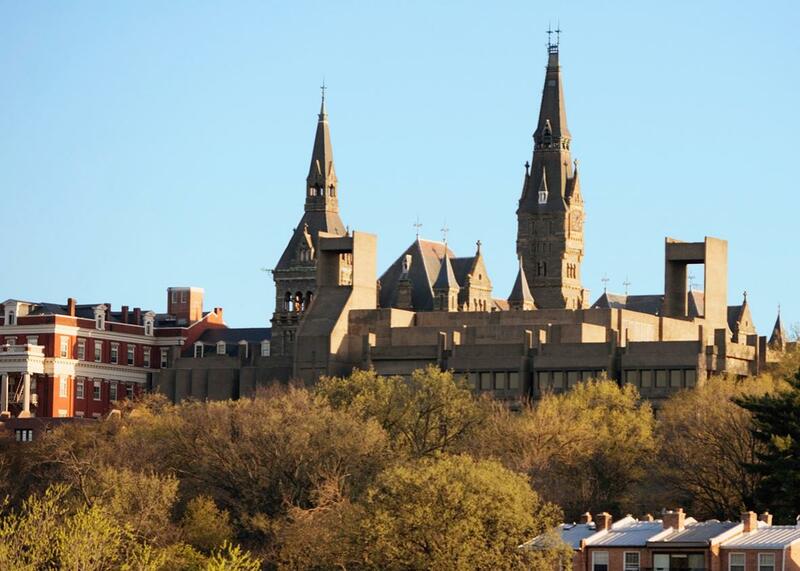 What happens if more institutions follow Georgetown’s lead? On Thursday, Georgetown University announced its decision to extend preferential treatment in the admissions process to prospective students descended from enslaved people owned by the university. How will those people be able to prove their family connections? In some ways, the thousands of people with ancestors who either labored on the Maryland plantations that supported the university or were held on the Georgetown campus may have an easier time proving a relationship to their enslaved forebearers than other black Americans typically do. The nonprofit Georgetown Memory Project has hired genealogists to research the lineage of people sold by Georgetown and to reach out to people it identifies as descendants; the university is also putting documents related to the university’s slaveholding history online. Because of the records kept by the Jesuits who ran those plantations, lineages may be less difficult to trace than has often been the case for those black Americans who have tried to uncover their genealogies. But what happens if more institutions and organizations begin to follow Georgetown’s lead, offering preference—or, as the university has failed to do, financial benefits—to people who can prove their connection to ancestors owned by the institution in the past? If such advantages are made widely available, as tribal benefits are for some people able to prove Native American heritage, the stakes of being able to define ancestry will go up, and the spotty nature of records connecting black Americans to enslaved ancestors will become all the more frustrating. I asked two genealogists with expertise in this area—Kenyatta Berry, host of PBS’s Genealogy Roadshow, and Tony Burroughs, founder and CEO of the Center for Black Genealogy and author of Black Roots: A Beginner’s Guide to Tracing the African American Family Tree—to explain what gaps in the archives still challenge black Americans doing genealogical research and how they work around those gaps. For all black American families looking to trace lineages back into slavery, the Civil War and Reconstruction period of the 1860s and 1870s is a crucial turning point. The United States census counted free people from 1790 through 1940; for that reason, it’s a mainstay of many genealogical researchers (and it’s conveniently digitized and searchable). But freed slaves only showed up in the census by name starting in 1870. If a researcher finds an ancestor in the 1870 census, it’s still not a sure thing that that person was a recently freed slave (the census didn’t record his or her status). “You can’t do genealogy based on assumptions,” Burroughs cautioned. “You can’t assume that your ancestors were enslaved without finding evidence of that.” There were hundreds of thousands of free people in the North and the South before the Civil War; Burroughs often sees people with free ancestors go down research rabbit holes, looking for an enslaved ancestor where there wasn’t one. Other Reconstruction-era records could allow a researcher to hazard a guess as to the slaveholder’s name. The records of the Freedmen’s Bureau contain marriage certificates, labor contracts, and sharecropping agreements; since many former slaveholders ended up contracting with former slaves to sharecrop on their land, this could be a clue to a connection. During Reconstruction, for example, Berry’s ancestor Lewis Carter had a labor contract with Dr. John W. Taylor, in Madison County, Virginia; Berry also found evidence that Taylor was present at the birth of Carter’s first child. This evidence allowed her to begin to establish a link between the two families, despite the disparate surnames. Wills, estate inventories, deeds, and mortgages can show how human property changed hands or was used to provide equity for a slaveholder. These records can be difficult to work with—many aren’t available digitized or aren’t indexed for handy searching. A number of Southern county courthouses burned down in the 19th century—sometimes due to military activity during the Civil War—which makes the researcher’s task more difficult. The domestic slave trade, which moved more than a million people, mostly from the Upper South to the Deep South, between the 1820s and the Civil War, could throw a researcher for another loop. “I’m lucky,” Berry said. “On my mom’s side, they were in Virginia and stayed in two counties in Virginia. They didn’t get sold to Louisiana—at least, my direct line did not. Think about the folks that were sold, though. How do you track that movement?” Thinking of a ship’s manifest I once wrote about in a blog post on the Vault, I asked whether records of the major slave-trading companies, such as Virginia’s Franklin & Armfield, could be used to track people who were sold between states. “There isn’t a consolidated database, so they’re scattered in lots of different places,” Burroughs said. He said his company is embarking on a project to bring these sale records together. All of these difficulties considered, both genealogists agreed that increased interest in black history, and the availability of digital tools, had positively changed the prospects for black genealogists in recent decades. “When I started, in 1975, there were no African American genealogical societies, no books of African American genealogy,” Burroughs said. Berry, who began her research in the mid-1990s, says the internet has helped her make connections with people in faraway places who might be willing to go to a courthouse and look up a will for her. Berry wishes institutions would try harder to make their relevant archives available—and visible and searchable—online, and that white researchers who found evidence of slaveholding in their families would be sure to make an effort to make family documents public, for black researchers to access and use. Both Berry and Burroughs wanted me to make it clear to prospective researchers that the challenges of finding enslaved ancestors might seem great, but they are not insurmountable. Still: I am a person with a love of research, and listening to the two genealogists speak about the barriers they had found, and crossed, in tracing their own family histories, I found my head spinning. It became clear that any future institutions intending to extend benefits to descendants of enslaved people must make it a practice to do as Georgetown is doing and offer help to people who need to find the relevant records to prove their connection.